Take this training via WEBCAST at a time and place convenient to you. 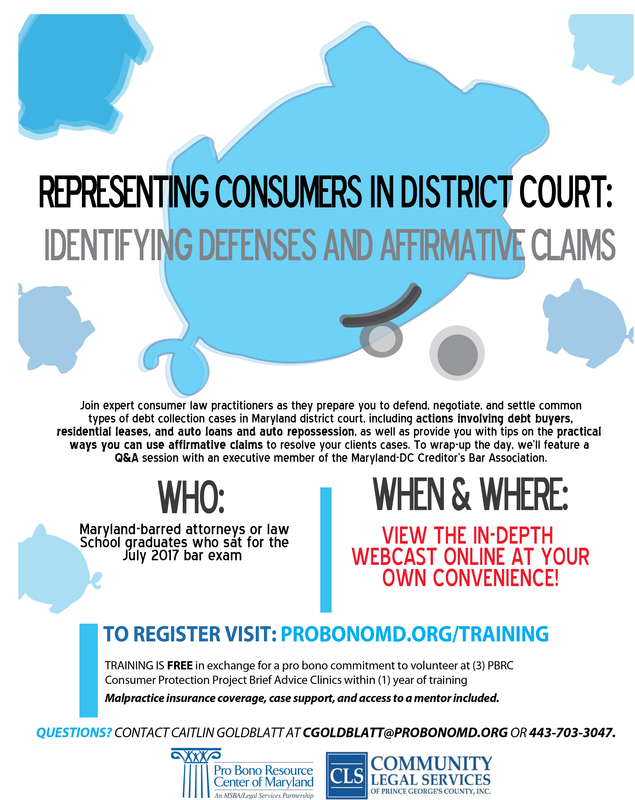 Join some of Maryland’s top consumer law practitioners as they prepare you to defend, settle, and negotiate common types of debt collection cases in Maryland district court, including actions involving debt buyers, residential leases, and auto loans, as well as practical ways potential affirmative claims may be used to resolve your client’s case. This training is offered as part of PBRC’s Consumer Protection Project (CPP). It is offered free to Maryland attorneys, in return for a pro bono commitment to volunteering at three (3) PBRC CPP Brief Advice Clinics in Baltimore City or Prince George’s County within one (1) year of registering. CPP is a joint venture of the Pro Bono Resource Center of Maryland (PBRC), Community Legal Services of Prince George’s County, Maryland Volunteer Lawyers Service, Mid-Shore Pro Bono, and Montgomery County Bar Foundation. Funding for PBRC’s consumer protection work is provided by the Administrative Office of the Courts and the American College of Bankruptcy Foundation.